The UN Sustainable Development Summit in 2015 has created an unprecedented momentum in human history to promote a truly inclusive and sustainable development. Global political consensus has acknowledged that inclusive and sustainable development cannot be met, as long as women’s empowerment is not ensured and a significant part of the world’s female population is left behind. 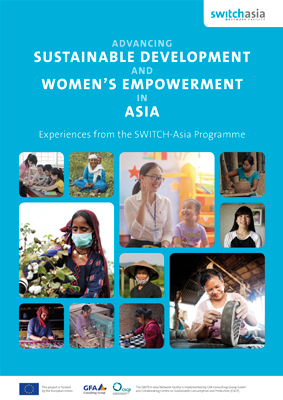 The Sustainable Consumption and Production (SCP) interventions promoted by the SWITCH-Asia projects have empowered thousands of women, primarily by means of capacity building, training and education, improved living and working conditions, business support and business financing opportunities. Simultaneously, they show that, when empowered, women are effective drivers of the sustainability agenda. Empowering women is thus not only right and fair. It also makes strong business sense. Through a review of 19 case studies from South Asia and Southeast Asia, this book illustrates how women’s empowerment and SCP are interlinked and mutually reinforcing. To view the ePaper version of the study, please click here. This publication is also available at the Publications Office of the European Union (ref. here).